Playing on the Pinn by Filmuphigh takes a personal journey to a dagger of rock on the Cuillin ridge on the Isle of Skye known as the Inaccessible Pinnacle. Sometimes having to face something as challenging as grief can trigger healing. After the sudden loss of her Mountaineering musician husband, Rachel Bolton decides not only to climb the Pinnacle but to play her fiddle to him on the top. 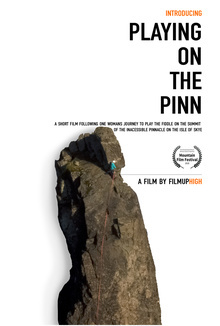 A moving film with an original score and plenty of breathtaking and dizzying footage of Skye’s mountains.